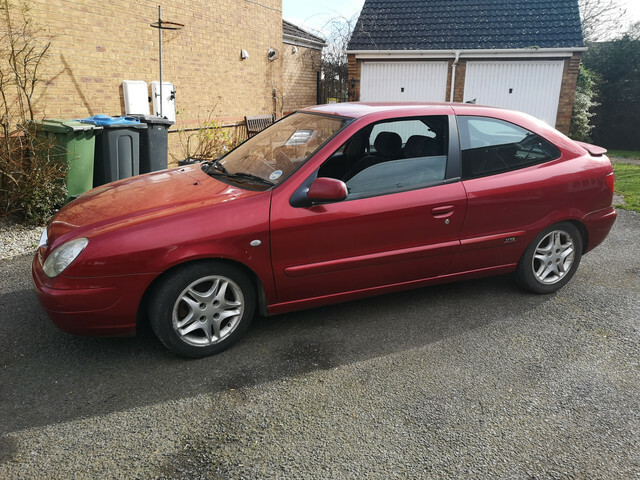 I know it's not a 306 (well, actually, it is really, just different clothes) but I'll put a project thread here for anyone interested. I've got a detailed thread going on Detailing World so I'll keep this one updated from this point onward too. For anyone wanting to catch up, this is the thread on DW. So, short version of the story so far. Sold my beach buggy, wanted another toy, interest in the Xsara piqued after I broke the Ph1 so looked about. Hardly any around but found a two owner, 51 plate Ph2 with 57k on the clocks, so jumped on it. 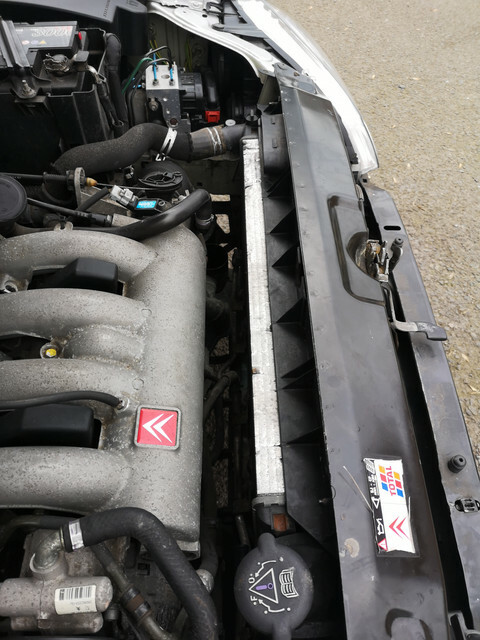 Other than a bloody good clean (under which the grime it turns out to be mint) it's not needed anything until the radiator gave up which I discovered whilst swapping the headlights for new ones. 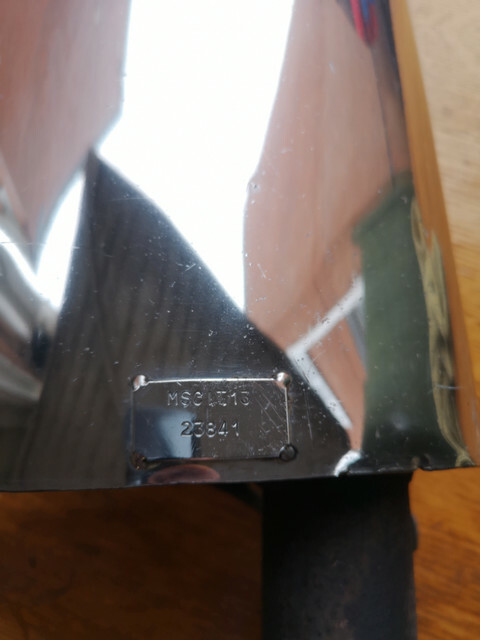 I've just scored a set of C5 steels for £5 (yes, £5!) from a seller in Ireland. 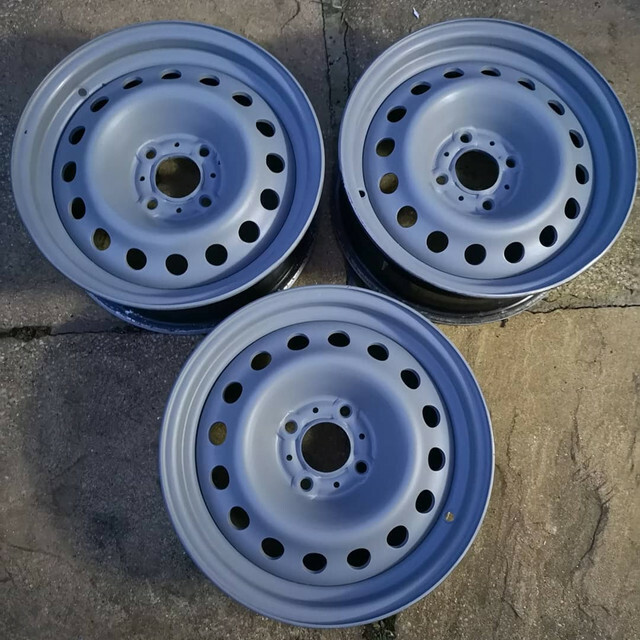 A mate has picked them up, taken the tyres off and is having them delivered to me. All in, they've cost me £30. Bargain. No real plans for this one as yet. Like to keep it standard ish but have bought the rear Bilstein B6 shocks Reece was selling and will likely put B6's on the front too. Needs a std cat and either a std or stainless exhaust to replace all the pattern crap exhaust system that's on it currently. 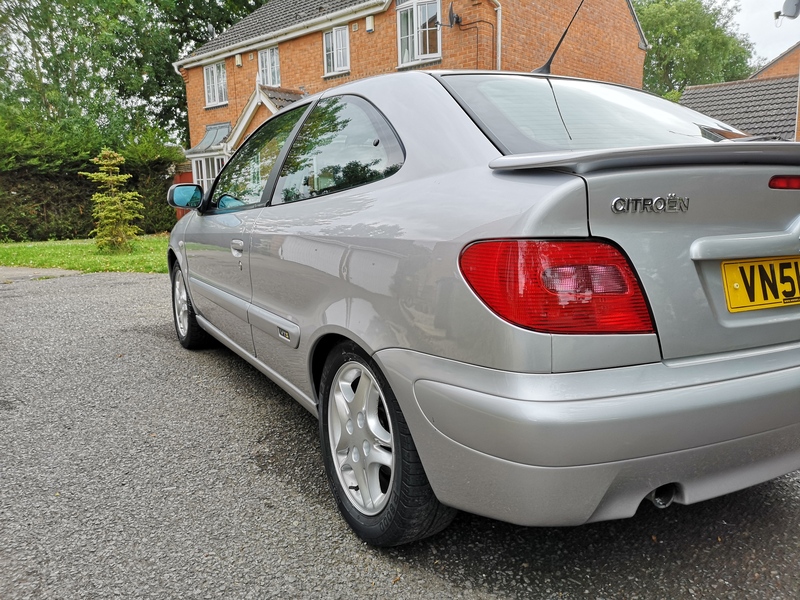 Looking forward to seeing the slightly less restorative side of you in the form of a xsara! There won't be too much in the way of mods to this one barring the suspension and exhaust. I'm just a fan of clean, std examples of hot hatches! I'll keep all the old bits so I can put it back to std. I can't believe how clean this thing is. Even looks spotless underneath! 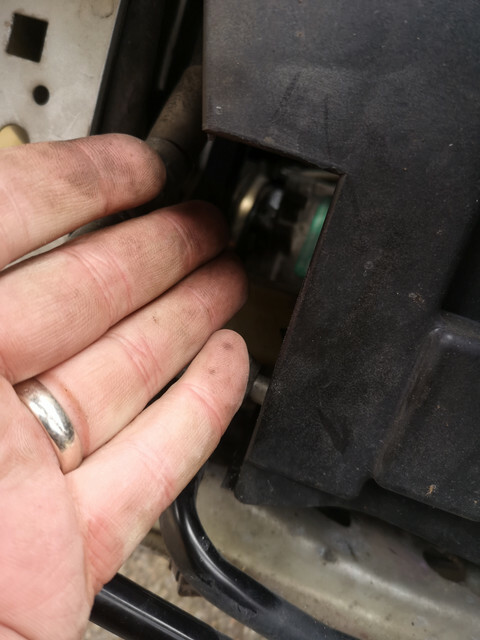 Not too much to tell on this, other than I discovered when changing the front headlights for some brand new ones that the radiator had failed and was leaking. Not a problem you'd think. 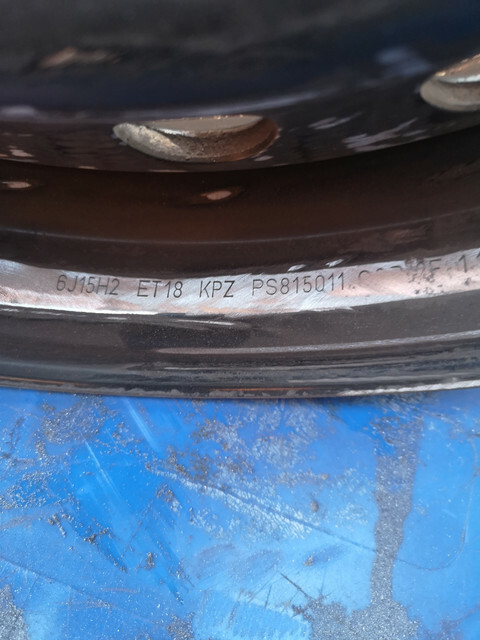 Try finding a pattern part for a Ph2 Xsara VTS. The rad is unique to this car, mainly to do with changes to the front end and how it all fits together. Essentially, there are two bolts that go through the slam panel, through the fan shroud and screw into mounts on the plastic tanks on the rad. Only managed to find two aftermarket radiators which directly reference the OEM part number and both are out of stock. 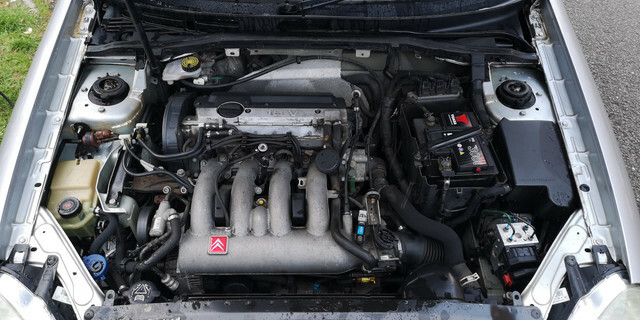 There are plenty that say they are for a Ph2 VTS but having gone through 3, they aren't. In the mean time, I picked up a bargain set of C5 steels. Grand sum of £5. Yes, £5. 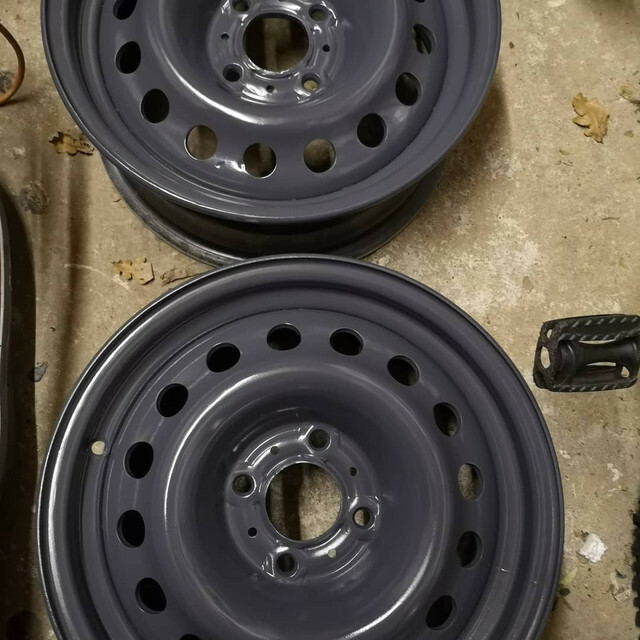 They were in Ireland (big thanks.to Josh Wainright for pointing me at them) so a mate over there collected them, had the tyres taken off and then sent them to me. So light the postage for all 4 was £24! Took a pic of the reference numbers as this confirms they are the genuine article! Dragged into the house, thoroughly washed and dried. 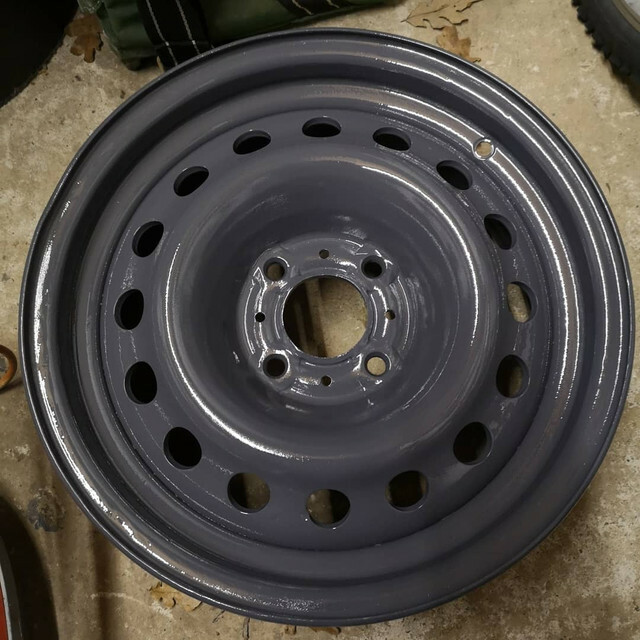 Went for a Graphite grey paint. Supposed to be a metallic but I can't see any in it. Never mind. that looks super tidy! Maybe its the lowest mileage example too! 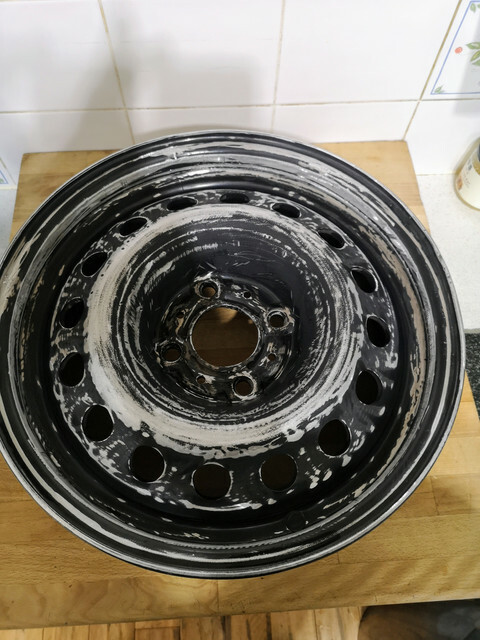 Definitely a score on the wheels! 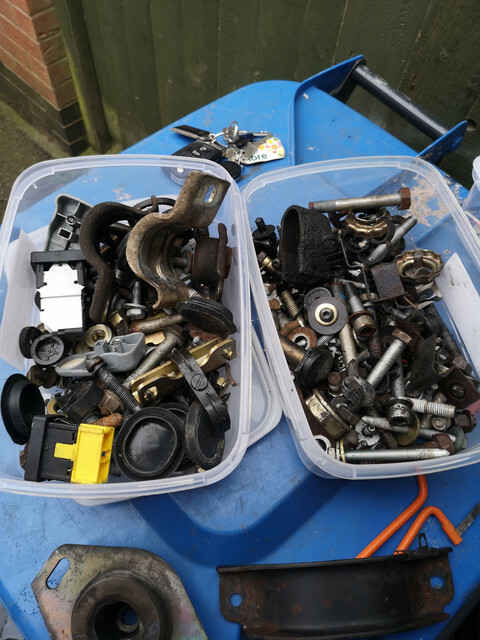 (08-02-2019, 11:52 AM)Eeyore Wrote: that looks super tidy! Maybe its the lowest mileage example too! 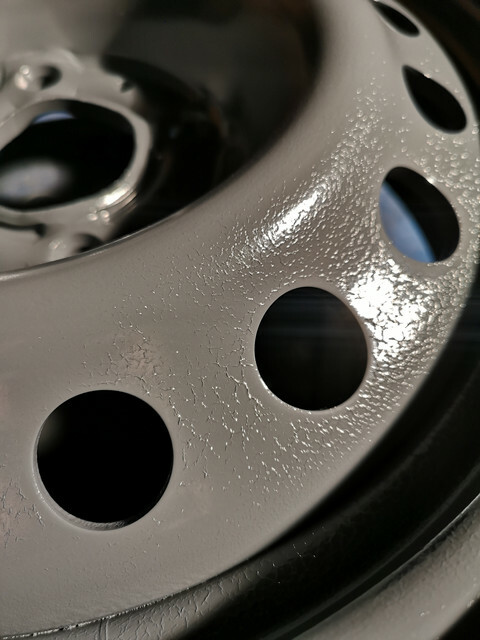 Definitely a score on the wheels! 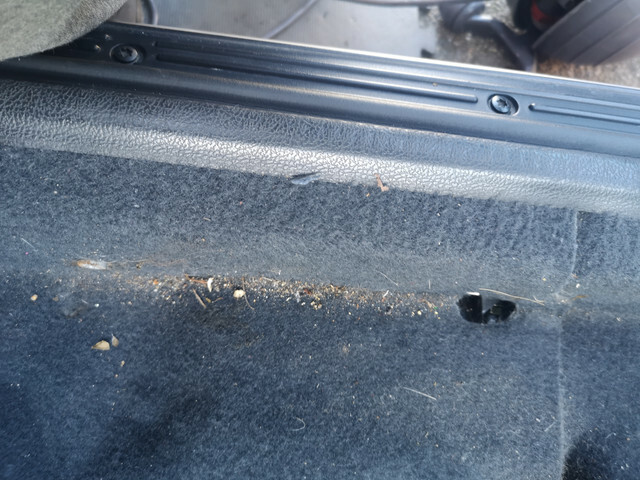 Decided to have the driver's seat out to see if I could figure why the seat was creaking. All this time I've thought it was the frame. First job was get the seat out. Easier said than done, because just like the 306, they stuck a stupid bolt front corner of the seat, up against the centre console, which a seat that won't move enough to get to it. You end up with an amalgamation of wobble bits and extensions, which normally make it easier, unless some idiot has been in there previously and rounded the head. Awesome. Much, much huffing, puffing, swearing and generally having a whale of a time with a torx screwdriver and that bolt was out. 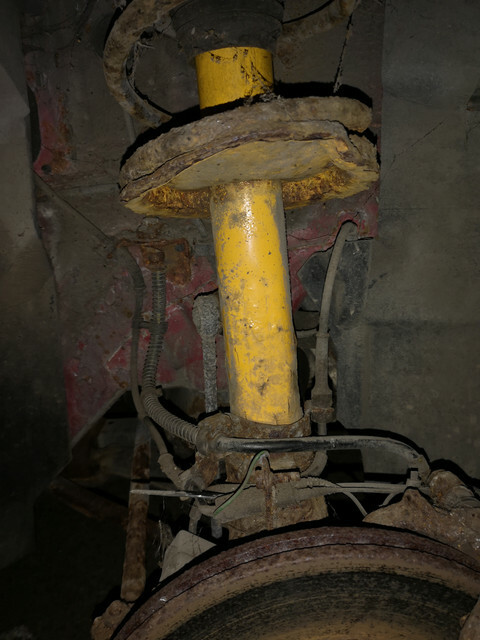 Moved onto the rear bolts. Much easier access,, but the one coming out of the sill felt odd, loose and floppy. I had a good idea what was wrong, confirmed by that horrible sound as the (non) captive nut dropped to the bottom of the sill. Marvellous. 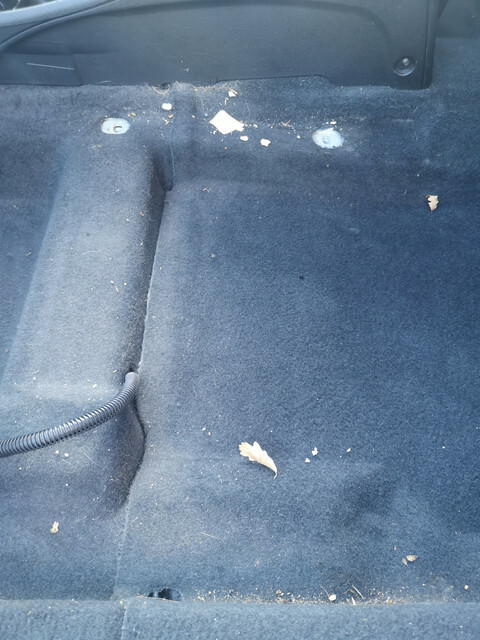 Seat out completely and I now know what the creaking was. The panel with the seat mount flexing. So on the positive side, I don't need a new seat frame. On the negative side, I need the car welding. And then I dropped my relatively new phone and cracked the screen. What a day and it's only 13:30. Every cloud.....silver lining etc? You betcha. 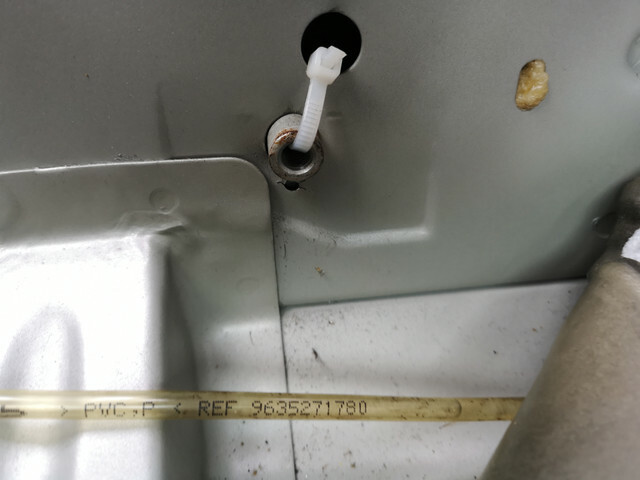 Having got over having the hump, I managed to fish the captive nut plate out of the sill (I say nut, it's actually a short length of threaded tube, inset into a plate, which then appears to be welded to the inside of the sill) and get it back into position and hold it there with a cable tie. 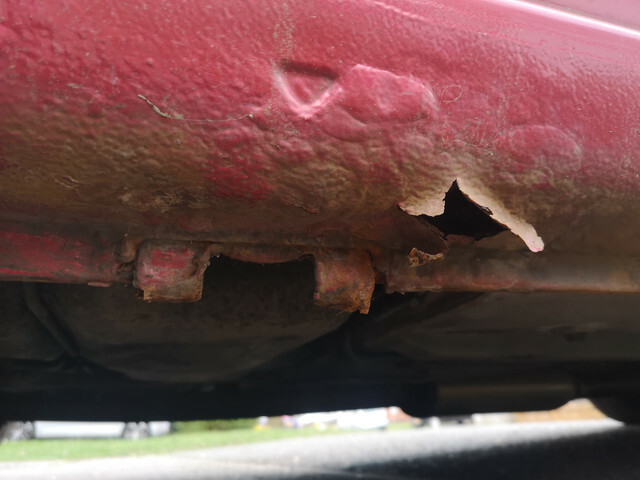 No idea how they'd want to fix it, whether they'd drill 3 small holes to allow it to be spot welded again or cut out a sqaure around it, weld it to that and weld the square back in....no idea. I'm not a welder. Yet. 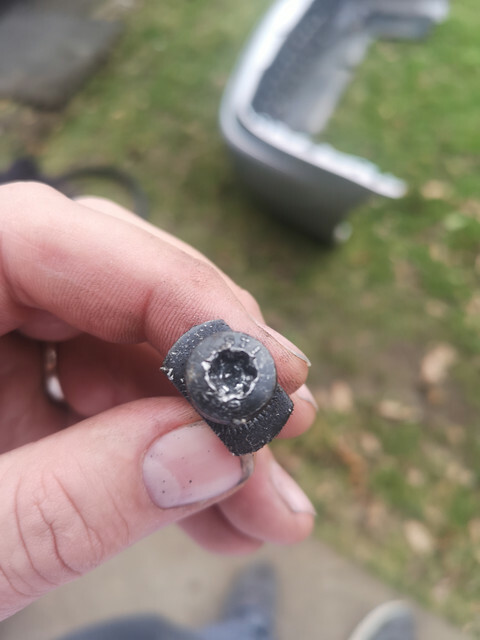 I kept pretty much every nut and bolt I took off the damn thing and, low and below, a seat bolt with a non chewed up head....! One less thing to worry about. 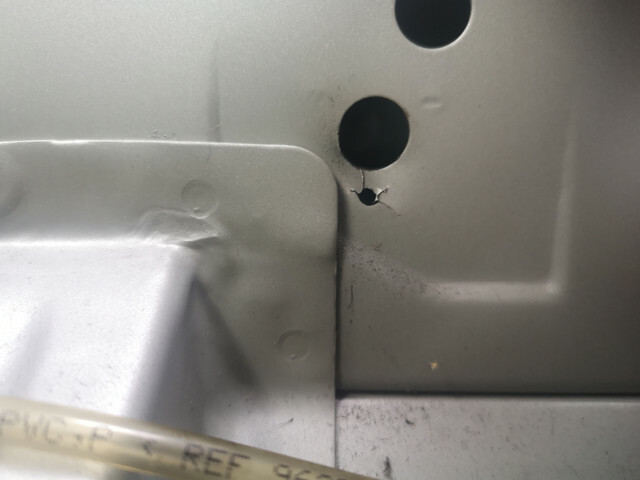 Attention then turned to the radiator......now, I'd been considering an alloy rad with fixings welded on for these bolts that go through the slam panel and fan shroud. Should work, but expensive. Once all together the radiator was fairly stable but still a bit of a wobble.....I then though could I make some fittings and Epoxy resin them to the rad. A quick look suggested yes, the header tank side will need a bit of work in terms of filing the base to fit the tank profile but it's do able.....other side is dead flat so no issue there....so I opened up the eBay app and bought a 250mm length of 20mm diameter Delrin. Glad you managed to turn your day around. 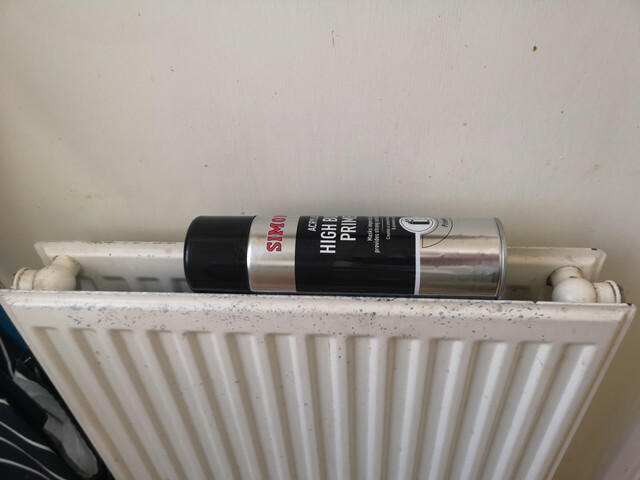 Really good news you seem to have found a fix for the radiator! What have you been using as your daily in the meantime? Btw, the most useful tool in my toolbox is the magnetic pick-up for recovering dropped fixings!!!! 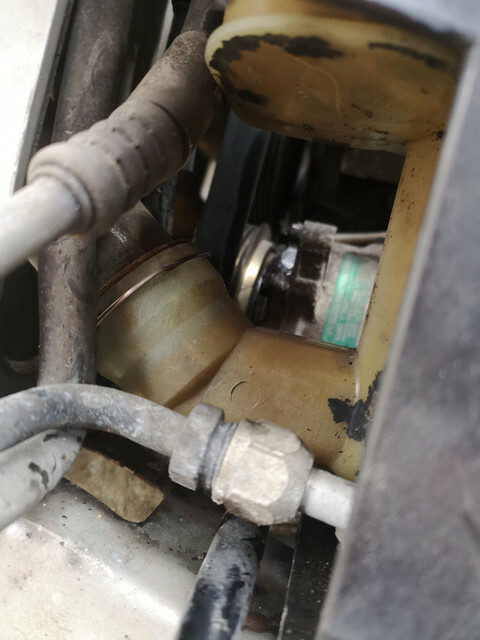 Rad fix kind of worked in that fabbing some mounts from Delrin and gluing them to the rad did the job....not noticing the rad had the old style bottom hose connection and then finding the o ring on the hose was knackered wasn't great. 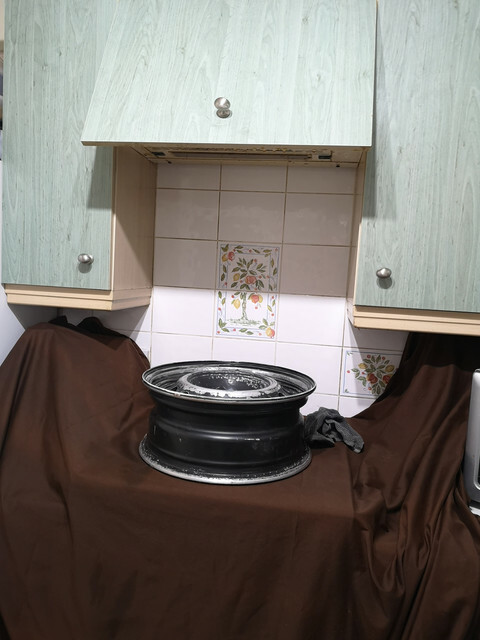 I have a proper radiator solution which I will sort on Monday. 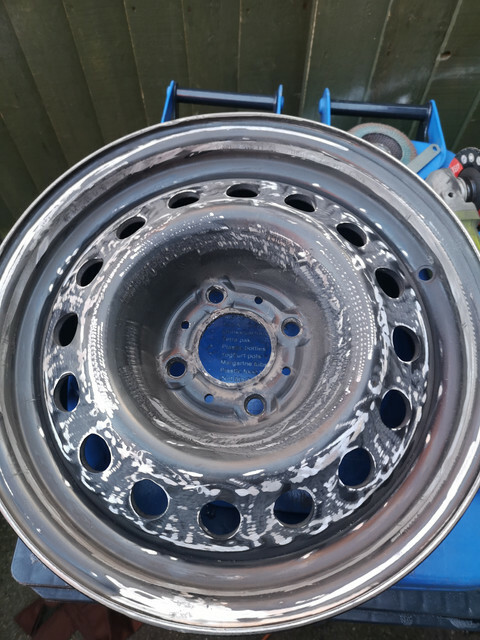 In the meantime, I got the C5 rims on....Carl Grimsley chucked the Pilot Sport 3's onto the rims for me and balanced them. 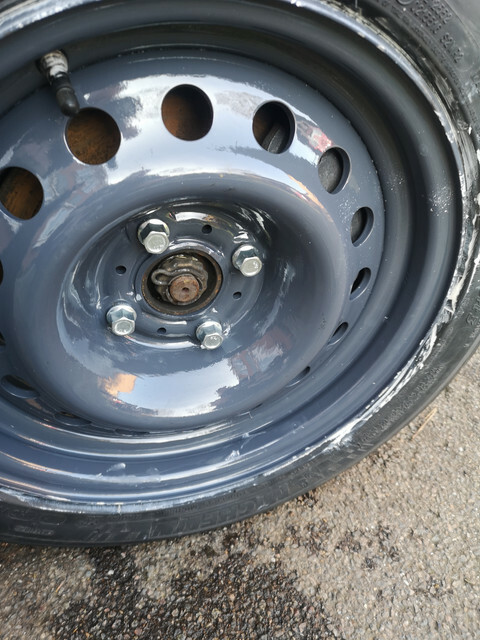 Brand new wheel bolts and we are all sorted. So, since I broke the Ph1, I've had a spare passenger seat in the garage. 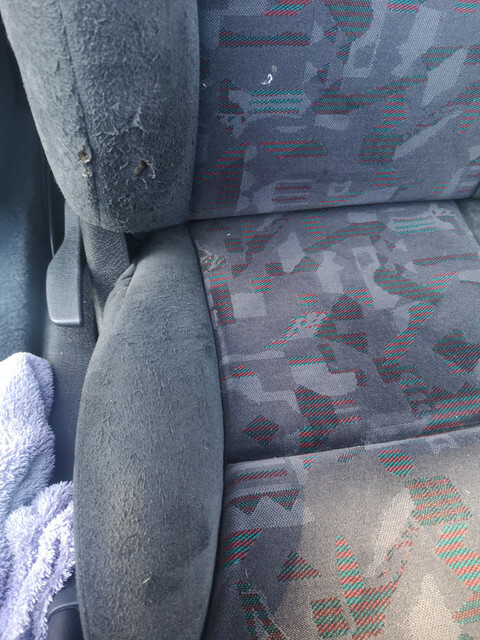 It's the same cloth pattern as my seats (they clearly had cloth left over from the Ph1) and the spare passenger seat has always been in better condition than the one in the car as the one in the car as slightly loose covers etc. I decided I would swap them over. 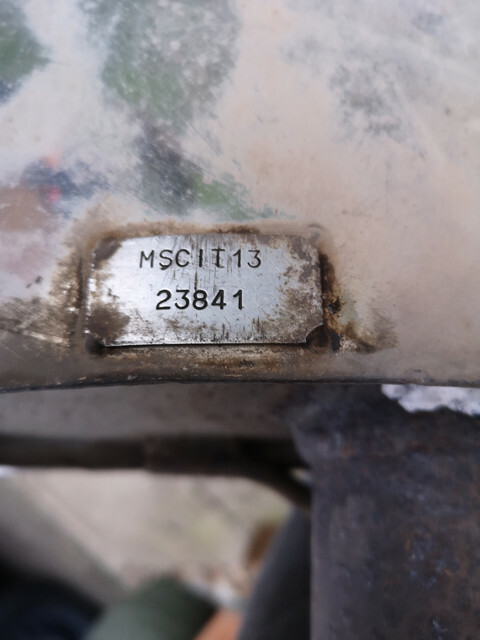 Treated my self to a set of 3/8" Torx bits from Halfords and took the seat out. Putting them side by side, they look broadly the same. However, the differences quickly became obvious. On closer inspection, there are several physical differences in the seat design. The handle to tilt the seat forward is in a different position, which I think is to do with the side airbag design of the Ph2 seat, even though the Ph1 seat had a side airbag. You can see the differences in this picture. 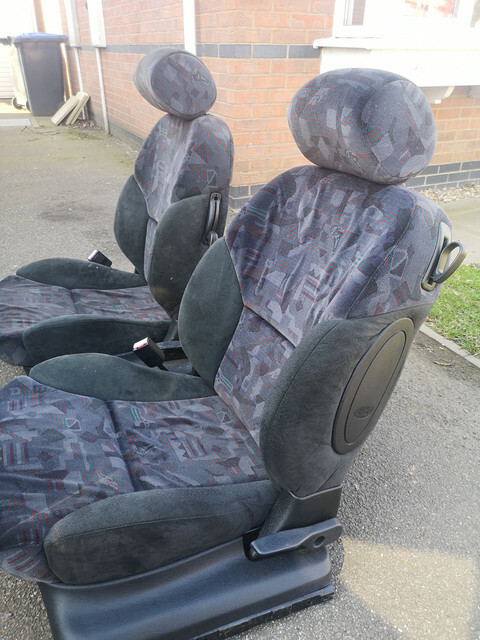 Clearly there are too many differences between the seats for me to be happy with swapping them over, so decision made to put the Ph2 seat back in, although not before I took the opportunity to have a good hoover. 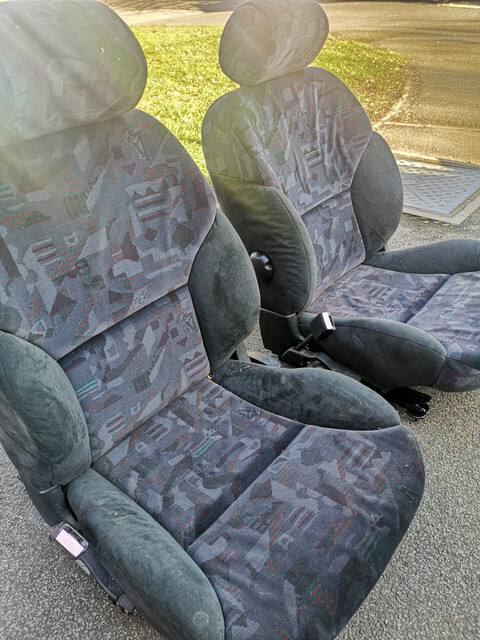 One thing that has occured to me is that the spare seat is a very useful candidate for providing material for the driver's seat. 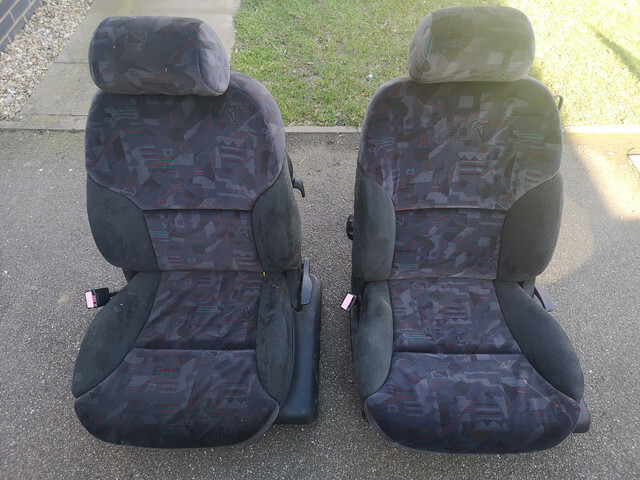 The driver's seat is very good for one of these car (the upright section has been replaced once before by a previous owner, as the old bits were in the boot when I bought it) but they are wearing again as you can see from the pictures. The spare seat will provide the material I need to sort that so once I've some time and some money, I'll get the seat off to the trimmers and get them to sort it. Great to see the progress you're making Ben. :0 Does the wife know?!!!! Do you want it as a cheap spares bin or hoping to make it another runner? More importantly, does this mean the Rallye has gone on the back burner? Nope, this one is a breaker and yes, the wife does know!. It was way too cheap to pass up. I'll more than cover the cost of it by selling the engine, beam, rack and gearbox. Rest of it I'll strip and anything not sold will be boxed up as spares and kept for mine. 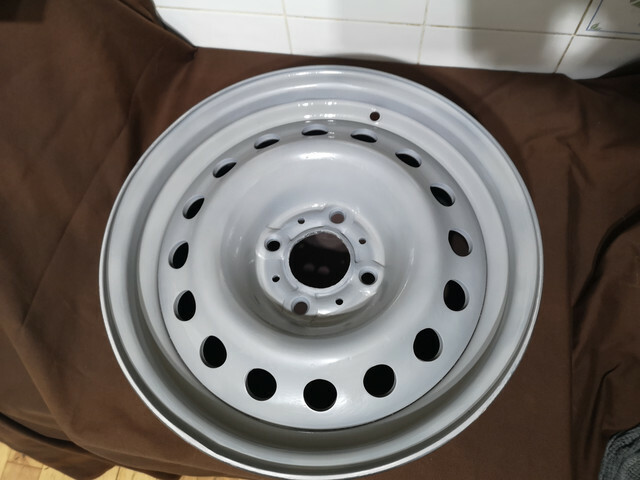 No, Rallye not on the back burner....looking for someone to weld it at the moment. 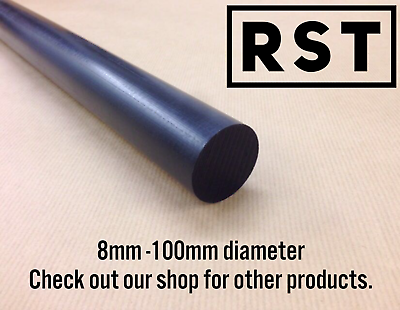 If you’re selling the rack... how much are you looking for it along with the pipes? 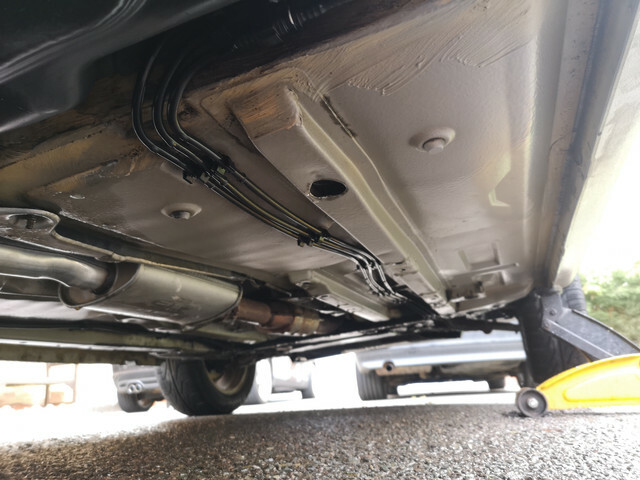 (27-02-2019, 11:37 AM)MY95 Wrote: If you’re selling the rack... how much are you looking for it along with the pipes? I don't know, how does £175 + post sound? 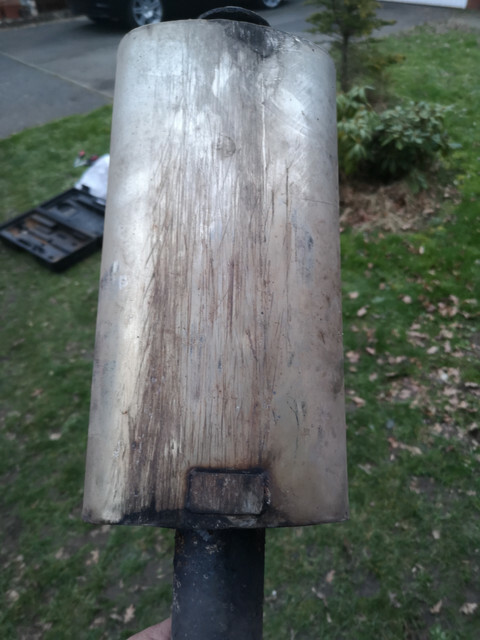 Mate came round, took him all of about 1 minute to do the 3 actual plug welds....as good as new now. 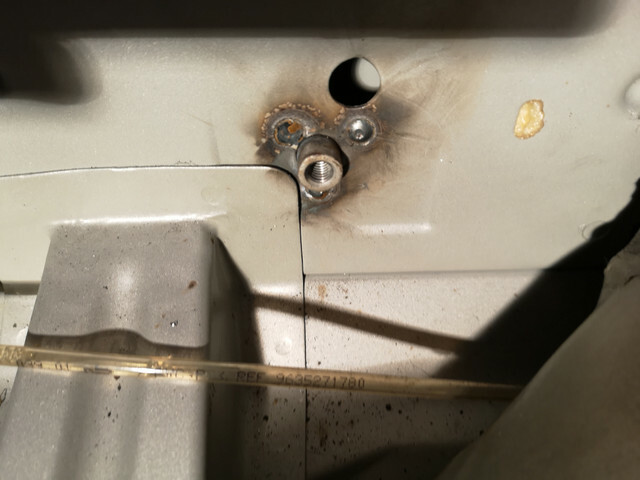 There was one moment of worry.....we disconnected the battery for the welding and once done, I connected everything back up and turned the ignition on. At this point I've got horrible thoughts of we've fried the fragile multiplex wiring with the welding etc. Except we hadn't.....the battery was flat. Jump leads from the wife's mini and it was all good. Phew. Then it's all about how quickly I can strip the donor! 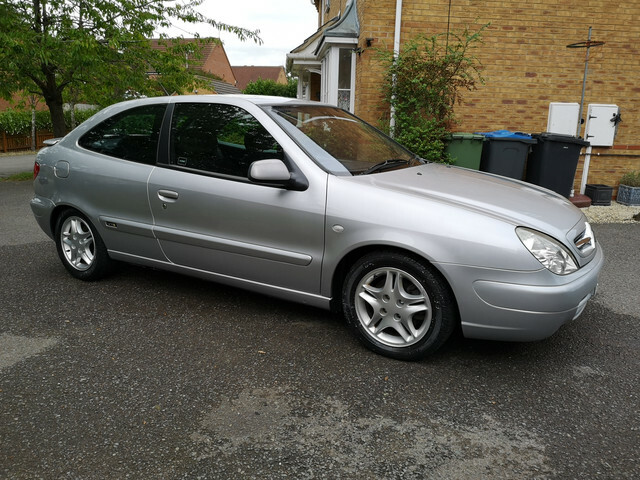 We picked the Xsara up Saturday morning as planned. Slightly later as my mate was a bit late getting the trailer to me but we got to the seller at about 11:30. 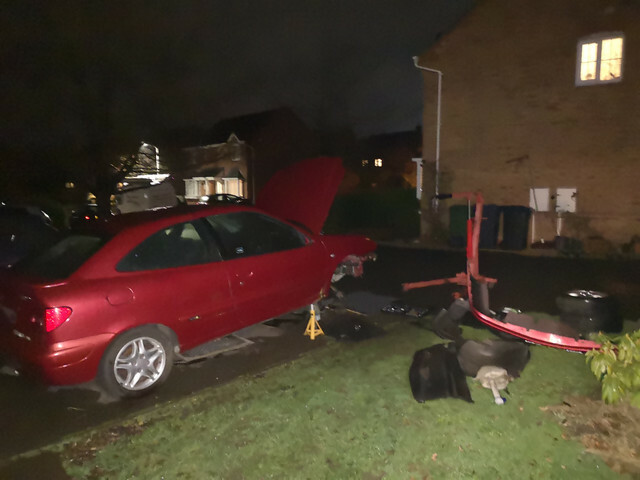 True to his word, he had the Xsara ready to go and drive able so we drove it out of the little Industrial estate to where we had parked the car (just wasn't room to drive in with a trailer on). Had the car driven onto the trailer, strapped down and ready to go within half an hour. Drove home and off loaded. Right, let's see what we've got. Generally, it's not to bad a car. Its been sat since 2012 as far as I can see, having done just 6 more miles than the mileage recorded at the 2012 MOT failure. Body is tatty, mainly peeling lacquer which was very common indeed on this colour. Starts, runs, drives etc so mechanically, it's not.bad. Nice hole here in the sill and looking bubbly around it! 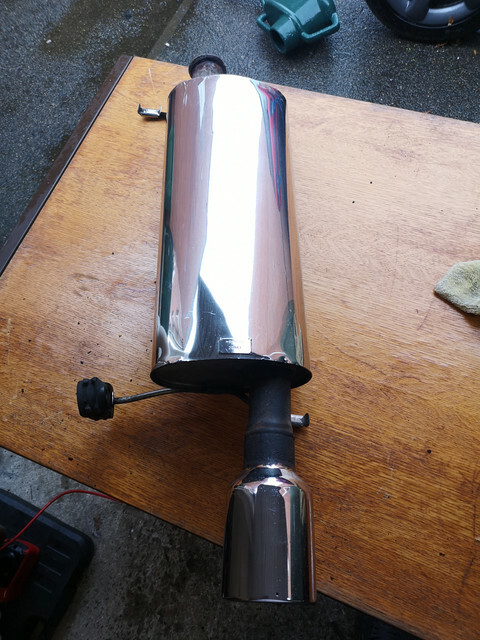 Exhaust is a full stainless, cat back system. Cat also, I think, appears factory but I need to have it off the car for a better look. One of my VTS owning chums turned up for the party. 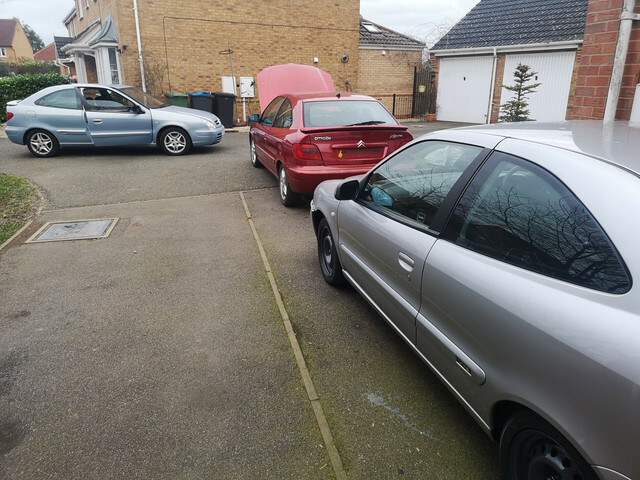 3 Ph2 Xsara VTS in one place! 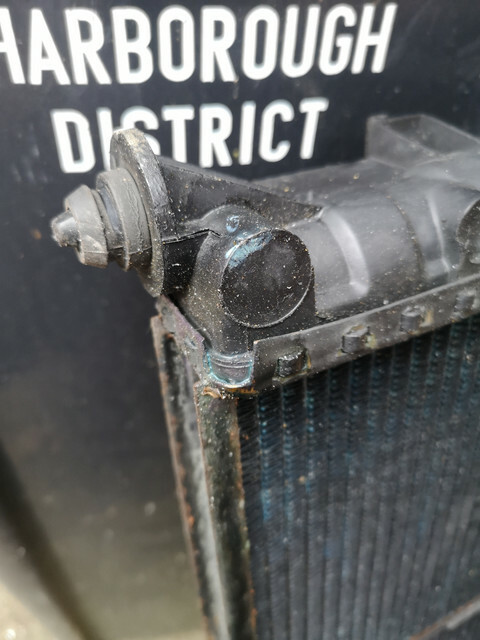 The bad news is the radiator is in worse condition than the one which has come off mine Shame but I still have one more roll of those particular dice. 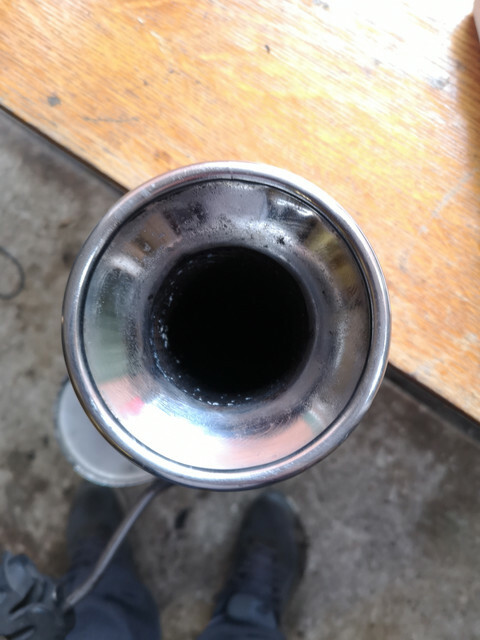 I made a start polishing up this exhaust. Apologies for the poor pics.....the lighting where I was working was about as far from perfect as you could get. I didn't take many pics but hope.you get the idea. Back box before..
Back box after being attacked with wire wool and then Autoglym Metal polish via a buffing bonnet on the Flex. Much cleaner. Still some work to do on the inside of the tip but, generally, much better. Breaking of the Xsara stepped up a notch today. Borrowed an engine crane from a mate so I could get busy. Just as i pulled up at his, my phone pinged with an email alert. A private message from.the 205 Driver's forum with someone making an offer on the rack, with his wife picking it up tomorrow as she was staying with her mum nearby.......best get busy then! Got home at 4pm and got the front end lifted up enough that I'd be able to work under it and dropped it onto axle stands. Then the rain started. 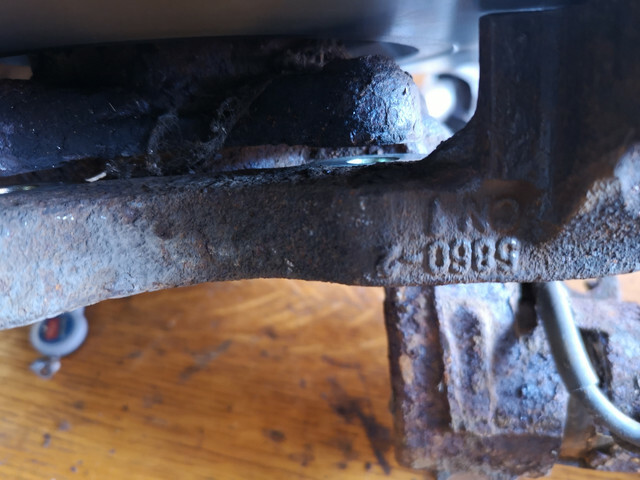 Much damp spannering later, along with one snapped subframe mounting bolt, the subframe, complete with rack, finally dropped into the drive. 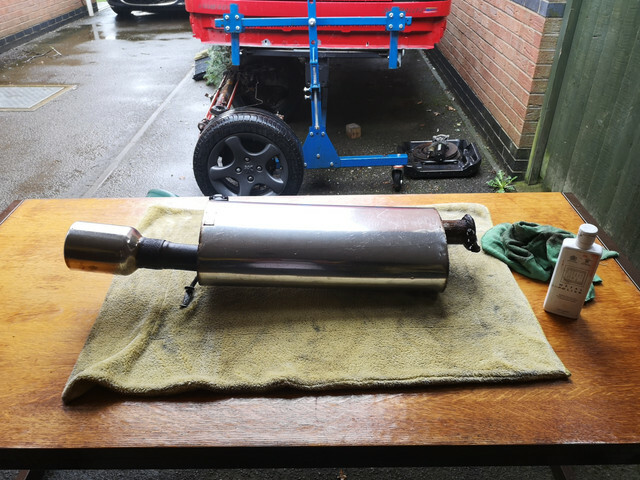 Taken to the workbench in garage and removed from the subframe. A couple of cycles of the rack to expel any old fluid and it was done, as I was. Absolutely knackered. One bonus though, the front suspension is indeed Koni adjustable stuff. I'll bet the rears are Konis too. 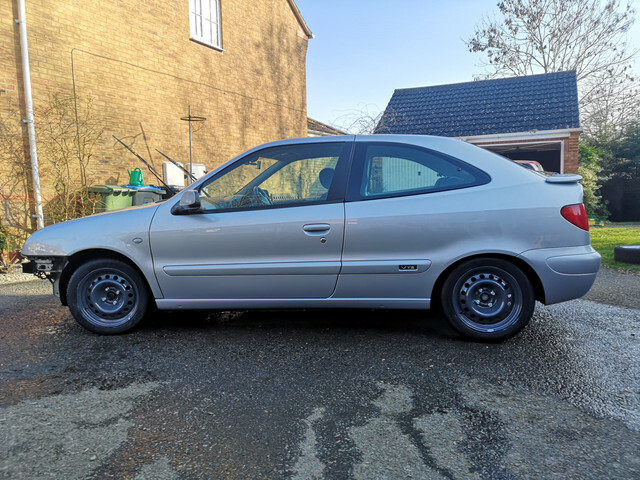 I've already sold a number of bits from the Xsara. Rack, gearbox, front brakes, radiator hoses and have someone who wants the rear beam. I'm already in profit and I've bagged myself a full stainless exhaust and a set of adjustable suspension...... bargain in my book. It's amazing what can be achieved with some motivational assistance from the missus! You have been busy Ben. Glad your purchase is working out as planned & has paid for itself. 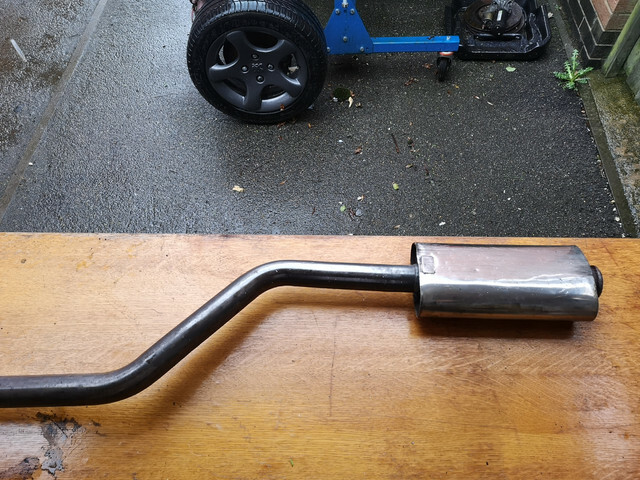 That exhaust cleaned up really nicely . Shame the shell is suffering in places. The Xsara looks good in red. It does but it goes exact the same way as diablo on a 306, in that the lacquer peels like crazy. 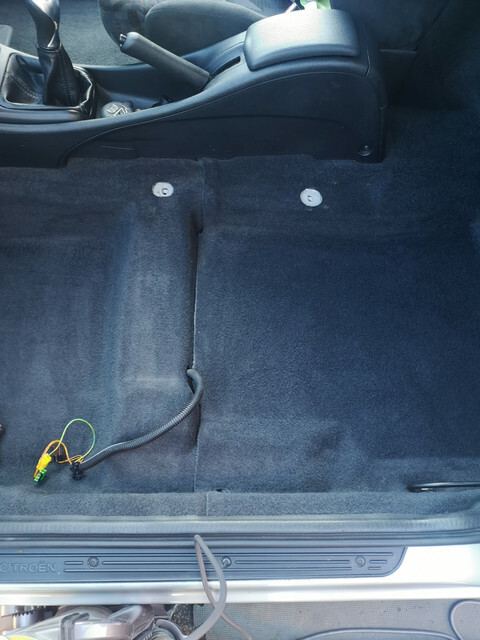 Every panel on the Xsara is suffering to some extent. Finally found a radiator for the Xsara. Came from Peugeot Parts in Leeds from one they broke a few years back. A but dusty from being sat on the shelf but all good. So with the radiator finally here, it was time to get on with it. First job was pull the silver car forward to the back of the breaker to give me room to jack it up and get the wheel off. 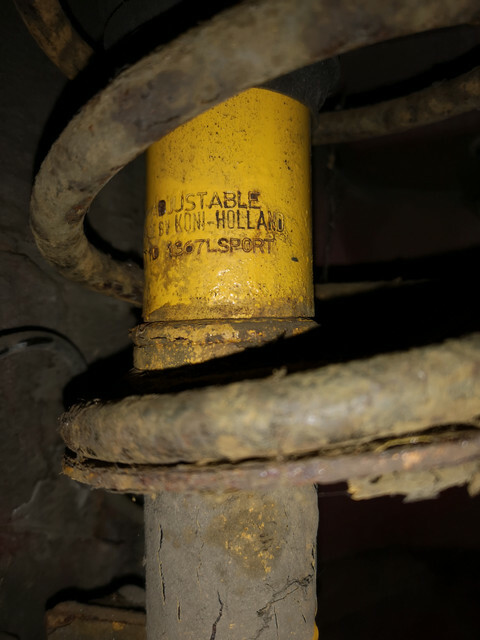 This was because job 1 was to swap the bottom hose out back to the original. All done in just a couple of minutes. I then decided that as I had everything off and available, I'd do the front brakes too. Everything came off easily, and the new disc put back on. The carrier needed much cleaning of crud to enable it to fit over the new disc but once done, fine. Until I came to bolt it back up......oh. Hello Mr Mysterious 6mm ish gap between carrier and hub mounting face. Took it all back off, checked and the put it all back on. Gap still present. 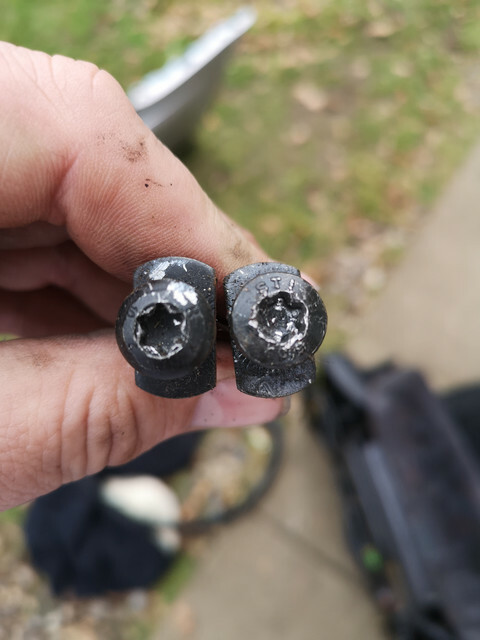 Knowing it has had a new hub at some point, I used the hubs from the breaker and then the hubs from the Ph1 breaker I still had as a sense check. Gap still there. I'm beginning to suspect the discs are wrong by this point. Put it all down, went inside, made a brew and did some checks. Service box, for once, was not very useful. 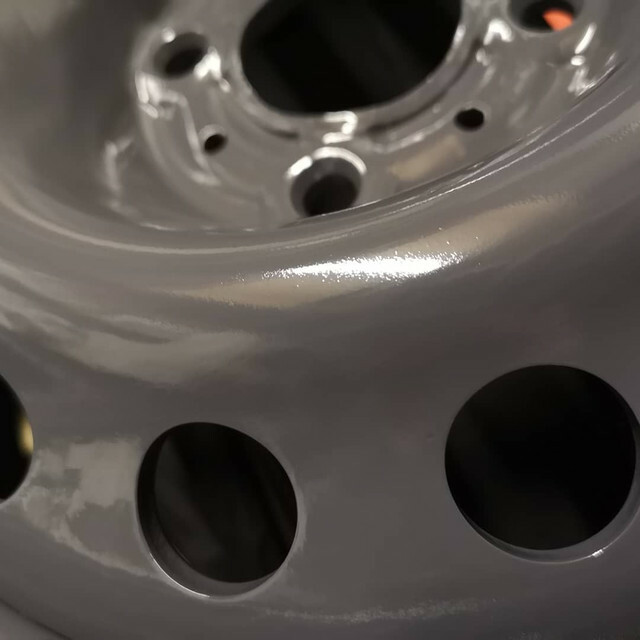 All it did was confirm overall disc diameter of 283mm. Eurocarparts website was much better. 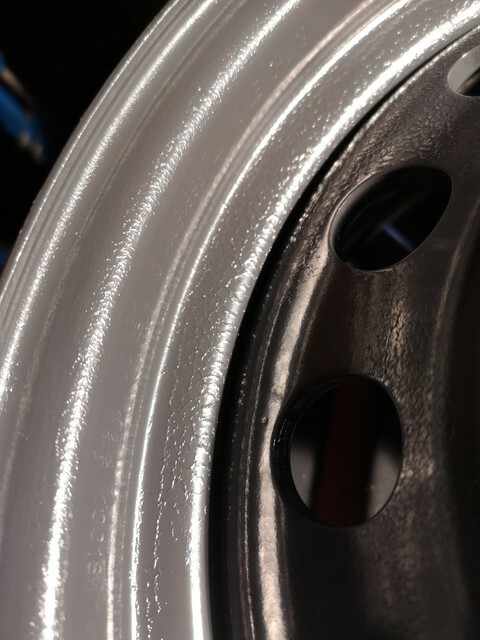 It suggested there were two disc fitments for the Xsara. 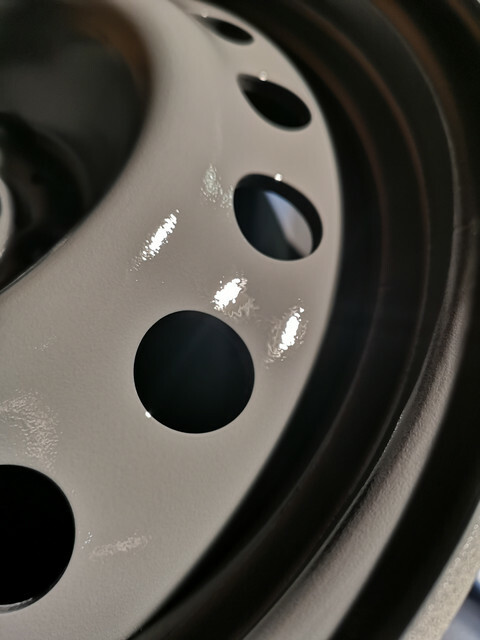 One with a disc height of 28mm, one with a height of 34mm.........hmmm, 6mm difference. The discs are wrong, frustratingly. At least that's all it is so I chucked the old gear back on, put the wheel back on and dropped it back on the floor. Raidator finally fitted although those French definitely designed that bottom hose connection on a Friday. You need the hands of a small child to get in to fit the clip that holds the pipe in place. Eventually, I got it done. First two litres in and all good. Nothing coming out where it shouldn't be. At this point I opened the three bleed points and air started coming out. Quickly added the next 3ltrs and then carried on until the rad bottle was full. Figured I needed to start the engine at this point. Battery was flat so I jumped it off the wife's car. Once it finally started, the engine mgt light was on, with the display above the radio was saying airbag fault (yes, because the seat isn't connected yet) and Anti-pollution fault (need to look into that some more....). I revved it slightly which helps getting the coolant round. I put all 9ltrs in and once the bleed points were streaming coolant steadily and not blowing air, they were closed off. I continued to let it idle and get up to temp. It got hot enough for the fans to kick in and I let them cycle in and out several times just to be sure. I was about to turn it off at this point when I noticed a strange noise. 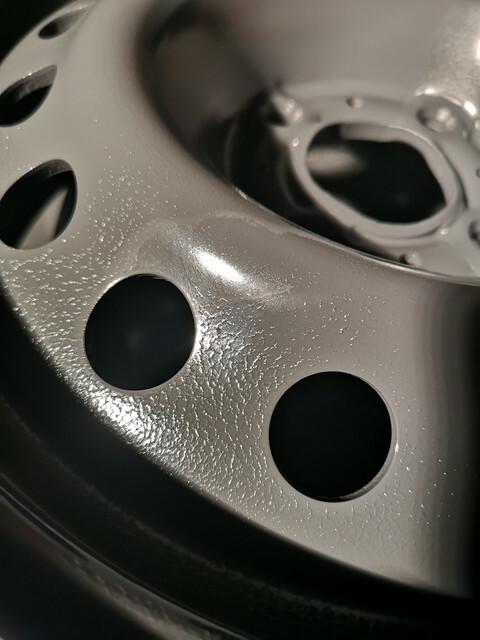 It sounded like it was knocking but when revved slightly, it all but disappeared. 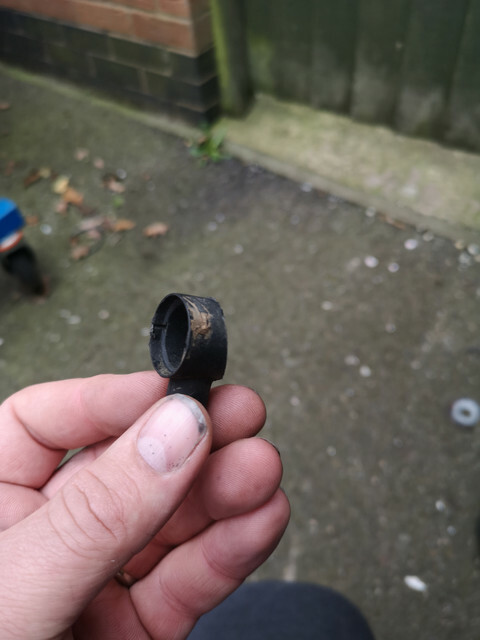 It sounded very much like it was knocking but from the left hand side of the engine. A quick listen and feel about revealed the noise went when i pressed on the timing belt cover. That quickly bought about and end to the days proceedings. Raidator fixed, other bits not now fixed. You couldn't make this up. 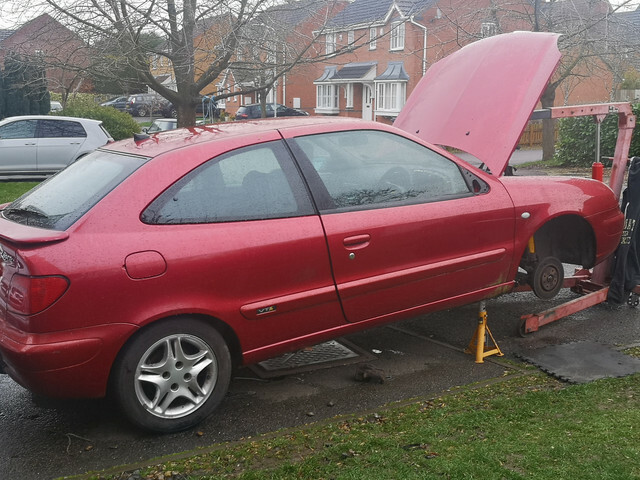 Perhaps the Xsara is objecting to being stood for 3 months. So tomorrow will be about having the cambelt cover off to see if I can figure out what's what. Spoke with Carl who suggested it might be the belt being loose. Given the car is fitted with the auto tensioner, I'm a bit concerned. Bet you're glad you caught it now before it slipped and fubar'd the whole thing!